This is a scalable context timeline. 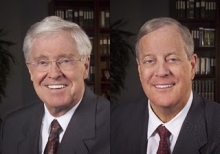 It contains events related to the event February 29, 2012: Koch Brothers Seek Control of Libertarian Think Tank. You can narrow or broaden the context of this timeline by adjusting the zoom level. The lower the scale, the more relevant the items on average will be, while the higher the scale, the less relevant the items, on average, will be. 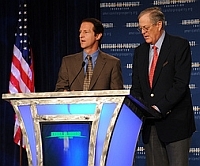 Amory B. Lovins, the chief scientist for the Rocky Mountain Institute and a well-known expert on sustainable and renewable energy, writes in a blog post for the Institute that the US solar industry is being attacked by an onslaught of disinformation and lies by the mainstream media, much of it designed to promote the interests of the conventional electric utilities. He begins by citing the infamous “flub” by Fox Business reporter Shibani Joshi, who in January 2013 lied to viewers when she said Germany has a more successful solar industry than the US because it has “got a lot more sun than we do” (see February 7, 2013). Lovins notes, “She recanted the next day while adding new errors.” He cites a pattern of what he calls “misinformed or, worse, systematically and falsely negative stories about renewable energy.” Some are simply erroneous, he admits, “due to careless reporting, sloppy fact checking, and perpetuation of old myths. But other coverage walks, or crosses, the dangerous line of a disinformation campaign—a persistent pattern of coverage meant to undermine renewables’ strong market reality. This has become common enough in mainstream media that some researchers have focused their attention on this balance of accurate and positive coverage vs. inaccurate and negative coverage.” The coverage issue has become one of note, he says. Tim Holmes of the UK’s Public Interest Research Centre (PIRC) says that media reporting has an outsized influence on the thinking of lawmakers. In Britain, Holmes says, left-leaning newspapers tend to write positively about renewable energy, while more conservative, Tory-favoring news outlets give far more negative coverage. Overall, negative coverage of renewable energy more than doubles the amount of positive coverage in the British press. In Britain, the “lopsided” coverage is largely driven by nuclear power advocates who fear competition from wind power. Myth: Renewable Energy Industries Cause Job Losses - Lovins cites the October 2012 claim by a Washington Post opinion columnist that subsidies for green energy do not create jobs, where the columnist cited Germany as an example of his assertion (see October 15, 2012). He cites data from a German study debunking the Post claim, showing that Germany’s renewable energy sector created over 380,000 jobs in 2011 alone and was continuing to create more jobs each year. Lovins writes, “More jobs have been created than lost in Germany’s energy sector—plus any jobs gained as heavy industry moves to Germany for its competitive electricity.” He writes that “a myth persists that countries lose more jobs then they gain when they transition to renewables.” He calls this claim an “upside-down fantasy” promulgated by a faulty study released by King Juan Carlos University in Spain in 2009 and written by an economist with reported ties to ExxonMobil, the conservative Heartland Institute, and the far-right Koch brothers (see August 30, 2010). The study claimed that for every job created in Spain’s renewable energy industry, 2.2 jobs were lost in the general job market. The story is still reported as fact today. But the study was debunked by experts from the National Renewable Energy Laboratory (NREL—see 1977) and the Spanish government. A 2012 study by the International Labour Organization shows that Spain is leading Europe in “green” job creation. Similar claims have been made about the American job market, with right-wing think tanks such as the Cato Institute (also funded by the Koch brothers—see 1977-Present and February 29, 2012) asserting that if people think renewable energy industries will create jobs, “we’re in a lot of trouble.” In reality, the American renewable energy industries created over 110,000 new jobs in 2012; in 2010, the US had more jobs in the “clean economy” than in the fossil-fuel industries.